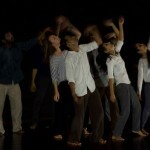 Is a 70-minute long contemporary dance performance choreographed by Abhilash Ningappa, Bangalore, India. Ronita is one of the 8 dancers that performed the piece that was premiered in Shoonya Centre for Art and Somatic Practices, Bangalore on June 2016. 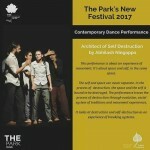 It won THE JURY AWARD in Prakriti Excellence in Contemporary Dance Awards (PECDA), in Chennai in August 2016 and toured in the PARK’S NEW FESTIVAL in Collaboration with PECDA in 6 cities in India including, Bangalore, Mumbai, Chennai, Hyderabad, Kolkata and Delhi in September 2017. It was also selected for a performance in PLATFORM 17 EVENT of the Attakkalari India Biennale in January-February 2017. This production is still going on. 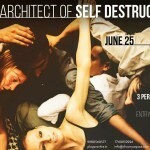 Watch “Architect of Self Destruction” video here. 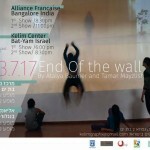 “End of the Wall” demonstrates two groups of dancers from two different countries – Israel and India- searching for the best way to communicate and work together despite mental, cultural and physical barriers. The performance takes place on two different stages – one in Israel and one in India – at the same time. 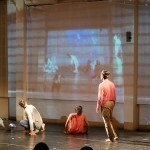 The dancers are communicating through the Skype format – which is projected on the back wall of the stage. An illusion of one stage occurs and mutual time and space are created. The dancers find ways to get to know each other and communicate with each other beyond the mental, cultural, and geographical walls between them. This unique screening format creates a “duplication” of the events which happen in both sides – sort of an image inside an image and so on – which dismisses the dimension of time and creates an illusion of endlessness. at times, we might feel that all the performers are in one physical space. The usage of the Skype technology – as the first tool of breaking the existing barriers- helps in creating the relationship between the performers and That, eventually, brings up similarities between artists from different backgrounds, different traditional countries, religions, communities and minorities. 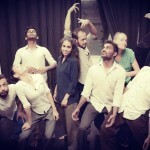 This is a one hour Contemporary Dance Production which is an Indo-Israeli collaboration Choreographed by Atalya Baumer and Tamar Mayzlish (Israel) which took place simultaneously in Bangalore, India and Bat Yam, Israel. 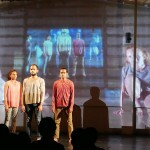 The work went through a year and half of process and premiered in Alliance Francaise, Bangalore and simultaneously in Kelim Choreography Centre in Bat Yam, Israel. The evening saw 2 back to back performances in India and Israel over Skype and was a major success. Ronita was one of the 4 Indian Dancers and 2 Israeli dancers that performed. Supported by the Embassy of India and Israel.